Yoghurt is definitely one of our favourite snacks in our household. Blake goes through a lot of yoghurt, as he has 2 kid size pots a day. I'm also a fan of yoghurt especially as it's a healthy snack/dessert option especially if had with your favourite fruit. I've always been interested in the idea of making our own yoghurt, but was put off the idea as I thought would be a complicated process. However when were invited to give the EasiYo yoghurt maker a go we were keen to give it a try. 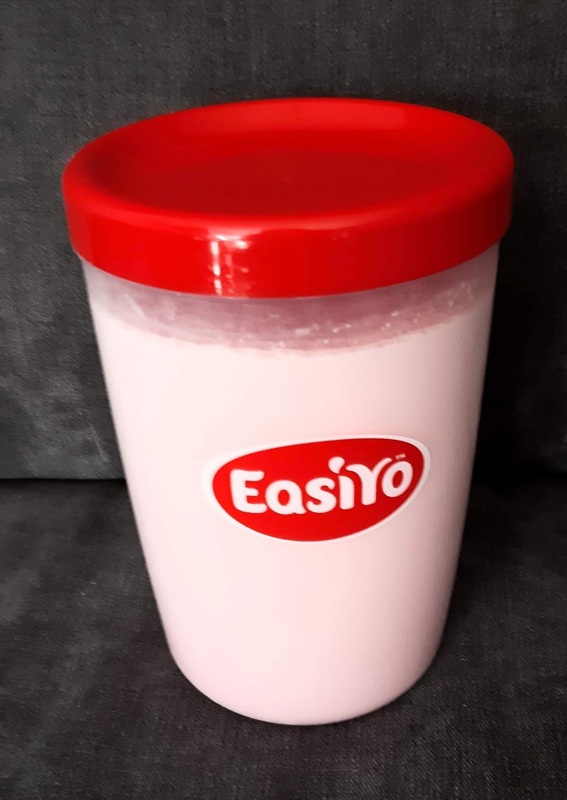 Making yoghurt with EasiYo isn't that hard and is a great activity to do with children. In fact its only a 3 step process for making fresh and delicious tasting yoghurt at home. All you need to make the yoghurt is their yoghurt maker, yoghurt jar and a sachet of one of their delicious yoghurt mixes. The mixes come in a variety of flavours such as; strawberry, banana, and vanilla. Plus more exciting flavours such as Passionfruit,Rhubarb and Mango and Coconut bits . They even sell some delicious Greek Style mixes which are right up my street. 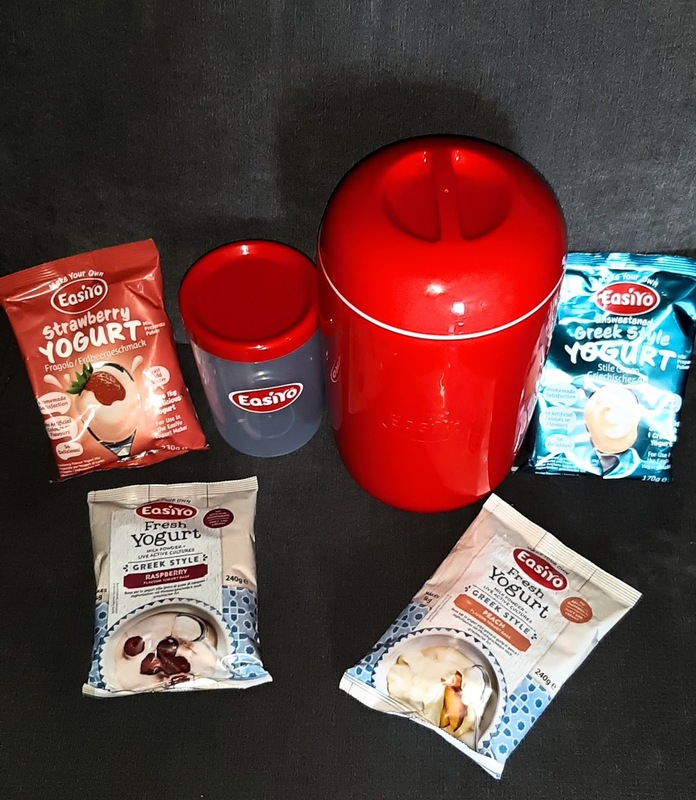 We recieved the starter kit which had the yoghurt maker, a yoghurt jar and x2 flavour mixes (strawberry and Greek style) we were also sent 2 flavoured Greek style yoghurt mixes in Raspberry and Peach. EasiYo also sell extra jars including ones that are smaller and ideal for packing in lunchboxes. 1. Half fill the yoghurt jar with tepid (room temperature ) water. Add the contents of the yoghurt mix, pop on the lid and give it a good shake. Then fill the jar up with more water leaving around 5mm from the top and shake again. 2. Place the plastic space all the way down in the yoghurt maker (making sure it’s the right way up) to the bottom and fill with boiling water to the top of the spacer. 3. Put your jar of yoghurt mix into the yogurt maker so that it sits on top of the spacer. The boiling water will rise part-way up the sides of the jar – don’t worry. Put the yogurt maker lid on and leave it for 8 to 12 hours (or overnight) to set. Once done all you will need to do is store in your fridge and the yoghurt will last for around 2 weeks of course you may have already eaten it all by then! The most important thing is the taste test! We are pleased to say its absolutely delicious. In fact Blake was eating mine and requesting more after so it's a big hit with our fussy eater. The yoghurt maker makes 1kg of fresh yoghurt and we will definitely be buying more of the mixes once we run out. I love that its so easy to set up and make the yoghurt and its easy to clean as well. 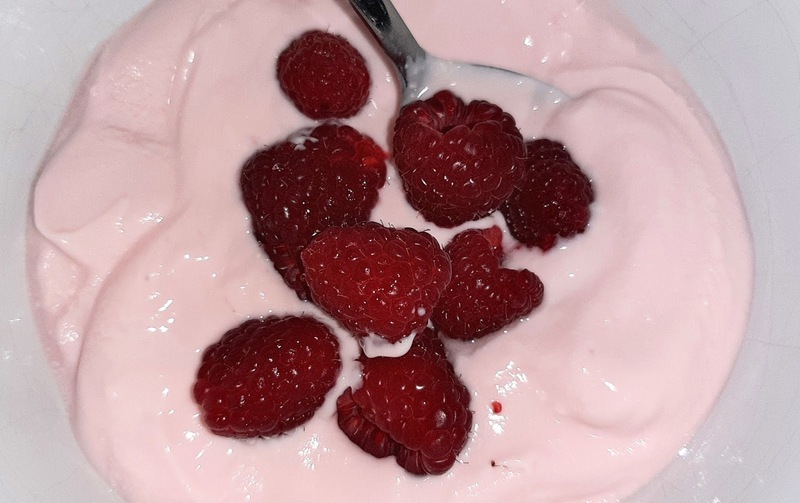 As you can see above I chose to add fresh raspberries to the top of my Greek Style yoghurt. You can also do so much with the yoghurt and EasiYo have a handy recipe page to give you some fun ideas for what you can make such as dips, smoothies, overnight oats and more! *We were given an EasyYo yoghurt maker in exchange for a review, however all thoughts an opinions expressed are our own.